In May 2013, abdominal pain was making me a miserable wife and mother. By the end of June, it had gotten so bad that John started doing research. He suggested that I stop eating gluten, and when I did, the pain went away. About a month later, the upper abdominal pain was still gone, but lower abdominal pain started. Again, John went back to his research and suggested that I cut out dairy. I did, and again, the pain went away. But what was I supposed to cook for my family so that I wasn’t making separate meals? Thankfully, I was referred to nutritionist Nancy Raymond from Optimal Health Solutions and health coach Lindsay Green Molina from Wholesome Ever After. Nancy confirmed my gluten and dairy issues and directed me to supplements to help heal my gut. Lindsay held my hand for 6 months, teaching me how to put this new lifestyle into practice. I’m so grateful to both of them. One of my family’s favorite dishes had been based on a McCormick spice packet called “Salsa Chicken”. Not only had they had stopped making the spice packet, but it also had a bunch of ingredients in it that would no longer work for me. Lindsay helped me revamp the recipe so that it worked for everyone in my family. Since then, I’ve added a bit more to it and I’ve also made it with pork. I’m often asked for the recipe, so I thought I would put it here. 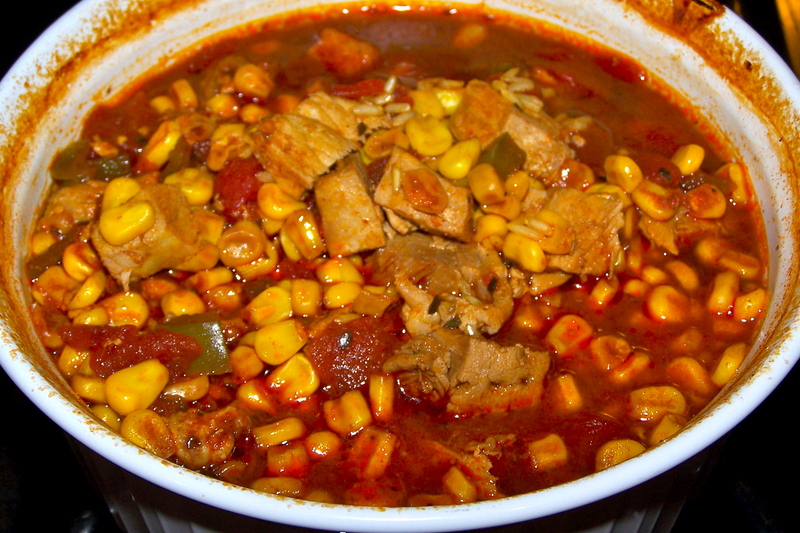 This is the Salsa Pork variety made with corn and green peppers. It’s a little soupier than it should have been, but still tasty. 1) Preheat oven to 375 F. Sprinkle rice in a 2.5 qt baking dish (I use a Corning Ware French White 11×8.5×3 inch dish), sprayed with olive oil or cooking spray to keep everything from sticking. Add vegetables. Shove chicken (or pork) down into the vegetables and rice so that it sits below the top of the pan. 2) Mix cans of tomatoes and seasonings in a separate bowl until well blended. Pour evenly over chicken/pork, veggies and rice. Add water to the empty bowl (that had the tomatoes in it) to get all of the seasonings out and pour that over the chicken and veggies. Add more water to the dish if the chicken isn’t covered (need enough liquid to cook the chicken and rice, but too much will make it soupy). If the water is too high, it will also boil over the edge, so use your best judgement. Cover with lid or foil. 3) Bake 45 minutes or until chicken/pork is cooked through and rice is tender (may take up to 75 minutes if the chicken was frozen). Remove foil (or lid). If not already cut up, cut chicken/pork into serving-size pieces (chicken should shred easily with 2 forks). Stir everything together before serving. 4) Serve as-is or with optional toppings (see above under “serve with”). Recipe doubles and triples well. Just use multiple dishes and spread it all out between them. I usually make three at a time (different sized French White dishes) so that it lasts for several nights. Feel free to mess with the ingredients, quantities and ratios and make it your own. Enjoy! It is very tasty and become a staple dish for sure!